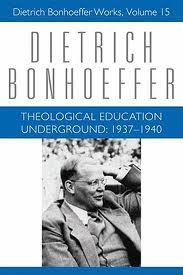 Review of Dietrich Bonhoeffer, Theological Education Underground: 1937-1940, ed. Victoria J. Barnett, Dietrich Bonhoeffer Works, Volume 15 (Minneapolis: Fortress Press, 2012), 726 pp. ISBN 978-8006-9815-7. In October 1937 the Gestapo ordered the closure of the Preachers Seminary for Confessing Church ordinands at Finkenwalde, which Dietrich Bonhoeffer had led for two and a half years. He now began a critical period of his life and ministry which was marked by much self-doubt and questioning about where his true discipleship lay. The letters, bible studies and essays contained in this volume give a vivid picture of his personal problems and choices, culminating in his visit to the United States in June-July 1939, but also in his well-known decision to return to Germany without delay to share his country’s fate since war looked inevitably close. The central point of interest in this volume can be seen in the very full record of Bonhoeffer’s brief stay in New York, along with the evident disappointment of his American hosts, who thought they were offering him a valuable asylum from Europe’s turmoil. Essentially this visit revealed to Bonhoeffer the strength of his attachment to his home country and to the group of seminarians he had been training. It was this attachment which drew him back to Germany only weeks before the outbreak of hostilities. It was a decision he never regretted, even though the consequences for his career were to be so fateful. These dilemmas were to be well illustrated, particularly in the circular letters which he wrote to the now dispersed seminarians, most of whom were soon to be called up for military service, and of whom a horrendously large proportion were to lose their lives. By such means Bonhoeffer tried to maintain their theological education underground, which the Gestapo was seeking to stamp out. Despite this harassment, Bonhoeffer firmly upheld his theological stance of resolute opposition to any measures designed to enforce obedience to the Nazi ideology. By the beginning of 1939, his personal dilemmas grew more acute. He could foresee that, at the age of thirty-three, he would likely be called up for military service, which he was determined to avoid. So in April he paid a quick visit to London, meeting with various leaders of the ecumenical movement, including Reinhold Niebuhr, who vigourously pressed him to return to New York and to the Union Theological Seminary so that he could undertake a number of engagements for both the church and university. Nieburhr’s advocacy pulled all the rights strings. So Bonhoeffer sailed across the Atlantic, having delegated his responsibilities at home to a chosen group of pupils. Much of his subsequent correspondence during the crucial month of June 1939, both to his German relatives and partners, as well as to his American contacts, is by now well known and is often quoted. But the full texts show that Bonhoeffer’s rejection of the American offers was not in any way due to an aversion to the church situation in the United States. Indeed his insightful comments on the American churches during his brief stay show that he was much more appreciative of their situation than he had been during his earlier visit in 1931. The text of his thirty-page essay on “Protestantism without Reformation” commenting with remarkable perception on the state of the United States Protestant churches, which was composed during the final days of his stay, is here reprinted in full. There is however no reason to question the version that it was the intensity of his attachment to Germany and to his coterie of friends there which drew him back, even though as he admitted: “in all my decisions, I am never completely clear about my motives. Is that a lack of clarity, inner dishonesty, or is it a sign that we are led beyond that which we can discern, or is it both?” The clearest statement of his position is contained in his letter to Reinhold Niebuhr, outlining the terrible alternatives facing Christians in Germany. “I know which of these alternatives I must choose: but I cannot make that choice in security”.